Outer surface: mamelons and astrorhizae. Water Canal System: poorly known, stromatactis-like. Distribution: Middle Paleozoic, Mesozoic, and Recent. Stromatoporoids are best known for being the main reef builders of the Middle Paleozoic. Everyone seems happy with that statement, at least up to a point. Also, almost everyone agrees that they are sponges -- which is almost meaningless since sponges are said to be merely a "grade of organization." The stromatoporoids have proven almost impossible to characterize beyond that point. The current, tentative, take on the group is that it is another "grade of organization," not a phylogenetic entity. It is often said that Stromatoporoidea is largely composed of stem sponges, or stem demosponges, massively calcified, with closely-spaced laminar or tabular layers and roughly vertical columns. After that, things get really peculiar. For example, stromatoporoids are first found in the Tommotian (Wood, 1998), or perhaps the Botomian (Benton & Harper, 1997) ... or should that be Middle Ordovician (Webby, 2004)? Stromatoporoids flourished until the end of the Devonian, when they became extinct (Webby, 2004) -- except that they were also a major reef component in the Late Jurassic Benton & Harper, 1997), and may not be extinct, even today (Rowland, 2001). Typically, we would now launch into a Philippic on the inevitability of such confusion when workers do not zealously guard against chaos by establishing careful phylogenetic definitions. However, we have already written too much on this topic and "as to the importance of a general zeal in the discharge of duty, believing you are convinced and satisfied, I say no more" . The problem is that, in this specific case, it is nearly impossible to construct a testable phylogenetic definition. So "zeal in the discharge of duty" is going to do us about as much good as it did Demosthenes and his Athenians. However, also like Demosthenes, we refuse to allow piddling details to get in the way of exercising our traditional right to run off at the mouth on subjects we know nothing about. On the left is the usual sketch of a stromatoporoid. In fact stromatoporoid morphology is quite variable. They are best known, and most typically found as massive "domical" structures, but other types exist: conical, mushroom-shaped, columnar, branching, or even thin and reed-like. Benton & Harper (1997) Their skeleton (coenosteum) was calcite (or aragonite). Since they were both large and mineralized, they are frequently preserved as fossils. Stromatoporoids frequently formed reefs with bacterial stromatolites, which probably accounts for their name. Indeed, misidentifications of stromatoporoids for calcified bacterial mats, and presumably vice-versa, are still being corrected. Schlagenweit (2005); c.f. Igo et al. 1988). Outer surface: mamelons and astrorhizae. Many paleontologists, even those who routinely work with stromatoporoids, seem to avoid trying to make sense of their anatomy. Most of these workers seem to believe that the living tissue of the sponge was restricted to the outer surface and one or a few levels down into the gallery. Benton & Harper (1997). Perhaps living tissues penetrated more deeply around the main channels of the water canal system. In any case, the outer surface is often organized around rounded projections called mamelons. A network of canals, the astrorhizae, radiate outward from the low peaks of the mamelons. Unfortunately, the details of the water canal system are rarely preserved, so it is hard to sort things out functionally. If stromatoporoids followed the usual pattern of sponge biology (and sponge physics), we might suppose that the astrorhizae were the incurrent openings, while the central region of the mamelons held the excurrent openings. However, the consensus view is that it was the other way around. Benton & Harper (1997); Webby (2004). Further, it is not clear that the mamelons had any particular significance since "[i]n many Recent 'sclerosponges' mamelon structures may be present or not within the same species (Hartman 1984)." Reitner & Engeser (1987). Inner Matrix: pillars and latilaminae. Webby 2004) aptly describes the inner mesh of the coenosteum as a "monotonous" gallery of vertical and horizontal elements. The vertical elements are inevitably known as pillars. In some cases, they may actually resemble pillars, as in the early Labechiida. Id. However, they may also form short, undulating walls, a bit like the septa of some Irregulares. Galloway & St. Jean (1954). Septum-like pillars also form the outlines of the astrorhizae. The pillars are not necessarily continuous through the entire gallery. They frequently terminate at one of the latilaminae. Id. The latilaminae have been characterized as pauses in growth, like annual tree rings. If so, this would imply a rather unsponge-like growth pattern. Sponges normally grow very slowly and are said to have lifespans measured in centuries, or even millenia although no one we know has quite enough free time to keep a sponge under close observation for even a decade or two). However, it is also believed that Paleozoic sponge reefs had growth rates comparable to modern corals. Wood (1998). Spicules: Mesozoic forms only. Paleozoic stromatoporoids apparently did not produce spicules. 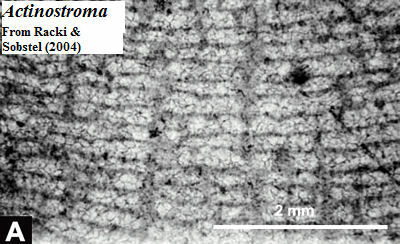 However, silica spicules have been observed in stromatoporoids from the Jurassic. In fact, the presence of spicules in Mesozoic stromatoporoids is one reason that these forms are thought to be unrelated to the Paleozoic groups. Others argue that that the entire skeleton may have be siliceous, but diagenetically transformed into calcite. Benton & Harper (1997). Neither argument is completely satisfactory. 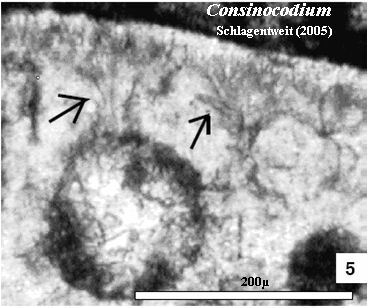 As the image shows, these spicules (indicated by arrows) are difficult to distinguish from ordinary pillars. Schlagintweit 2005). Consequently, any conclusions from this data would be ... spiculative. Water Canal System: poorly known, stromatactis-like. Schlagintweit's description of the Mesozoic Consinocodium shows that it is clearly more like a modern demosponge than a Paleozoic stromatoporoid. Note the large round cavities, possibly containing choanocytes or captive bacteria -- both common in demosponges. On the other hand, the extant Acanthochaetes, at the top of this page, is indistinguishable from a typical Paleozoic stromatoporoid in external view. Other information on the inner workings of the water canal system is hard to come by. 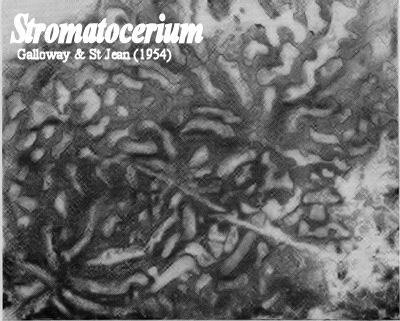 In doing our research, we saw a few brief descriptions and images, which looked suspiciously like stromatactis. Stromatactis is an "enigmatic" (Wood, 1998) material which looks like short, often interconnected, worm burrowings. It is usually assumed to produced by bacteria. Alternatively, stromatactis may be entirely abiotic. It is a common feature of Carboniferous marine cements, but has been reported from any number of other places, including Neoproterozoic methane seeps (Jiang et al., 2003). From this brief description, you will have gathered -- correctly -- that we weren't able to find much anatomical information on stromatoporoids, and that we believed only about half of what we found. Stromatoporoid workers are a microscopic branch of a miniscule paleosponge community, and most of the serious effort has gone into the ecology of Paleozoic reefs. Unlike anatomy and phylogeny, we can only scratch the surface of this ecological material. Those scratches are as follows. Distribution: Middle Paleozoic, Mesozoic, and Recent.The archaeocyaths died off at the end of Cambrian Epoch 2. After that there were no metazoan reef builders, and few reefs of any kind, until the Darriwilian Age of the Middle Ordovician. The first stromatoporoid "mud mounds" appear at this time. These relatively small domical stromatoporoids usually occurred in warm, shallow, areas on carbonate platforms, shelves, and around islands, in water conditions of moderate energy and relatively little sediment. Webby (2004). 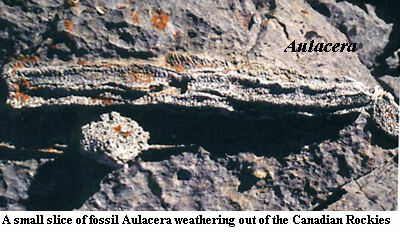 At about the same time, a second ecotype developed, which had a more columnar form (e.g., Aulacera). These were able to grow from soft, muddy substrates at greater depth. Id. This was a singular advantage, since there was a great deal of that sort of substrate lying fallow at the time. In the course of the Ordovician, these two types increased in size and abundance. By the Hirnantian Period, columnar forms almost 2 m tall formed calcareous "forests" in some regions. However, they never reached a worldwide distribution, as Ordovician stromatoporoids are only found within 30° latitude of the paleoequator. As you might expect, given this distribution, the stromatoporoids suffered badly in the end-Ordovician cold snap. 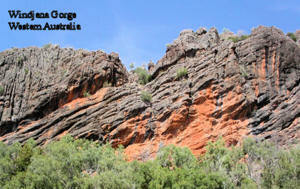 However, they returned to form the gigantic Middle and Late Devonian stromatoporoid reefs, some hundreds of meters in height, known in Australia, Morocco, Sweden, and other locations. Whether or not they became extinct at the end of the Devonian is not clear, but no stromatoporoid-like sponges are known from that point until the Triassic. Stromatoporoids never again dominated the landscape, but they formed an important part of various Mesozoic reef communities, particularly in the Late Jurassic. These Jurassic forms appear to have been a very different ecotype from their Paleozoic relatives (or analogues, as the case may be). The Mesozoic stromatoporoids tended to inhabit unstable, high energy, high-sediment regions, often in rather shallow, turbulent waters. Leinfelder et al. (1996); Benton & Harper (1997). They disappear again at the end of the Cretaceous until 30 years ago, when living species began to turn up in deep water at the height of the Cousteau Era in the 1970's.